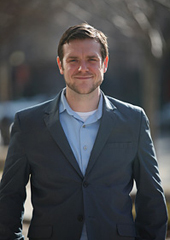 SciCom alumnus Matt Davenport has received the Newsbrief Award from the D.C. Science Writers Association for "Why Fruit Flies Could Make Your Beer Better," a video published by the American Chemical Society and its flagship publication, Chemical & Engineering News. The video, published November 25, 2014, is part of a regular YouTube series called "Speaking of Chemistry." Davenport, SciCom class of 2014, shared the award with video producer Elaine Seward of the American Chemical Society. Most science writing awards go to complex, multipart stories, but those awards often fail to recognize one of the most challenging—and most common—tasks of the science writer: writing short. The DCSWA Newsbrief Award honors the short, accessible and accurate pieces that make an enormous contribution to the public understanding of science. It is open to the members of the D.C. Science Writers Association, the country's largest regional group of science communicators. SciCom alumna Beth Mole, class of 2012, won an honorable mention in the competition for her piece in Science News, "Kangaroo gut microbes make eco-friendly farts" (subscription required), published on March 21, 2014. Davenport earned his B.S. from Michigan Technological University and his Ph.D. from the University of California, Irvine, both in physics. After completing the SciCom program, he joined the staff at Chemical & Engineering News—first as an intern, then as a full-time science reporter and video host. Read his online portfolio here. SciCom alumni have won the Newsbrief Award in two previous years: Nadia Drake '11 in 2011 and Meghan Rosen '12 in 2013, both for pieces in Science News. A fall-quarter course in the SciCom curriculum focuses specifically on covering new science research in 100 to 500 words.